Today's post is a two in one -- a swatch of one of my most treasured indie polishes and a blue polish for World Autism Awareness Day. Autism is a general term used to describe a group of complex developmental brain disorders - autism spectrum disorders - caused by a combination of genes and environmental influences. These disorders are characterized, in varying degrees, by social and behavioral challenges, as well as repetitive behaviors. An estimated 1 in 88 children in the U.S. is on the autism spectrum – a 1000 percent increase in the past 40 years that is only partly explained by improved diagnosis. I am not aware of anyone in my life that suffers from autism, and truth be told, before today, I didn't know that much about it. However, I went and did some reading on the Autism Speaks website, and now feel more educated and informed about the disorder. If you have a spare moment, you should do the same! Now, let's talk about the polish. This is Nail-venturous Lacquer's Flying Blue Jay. FBJ is a bright royal blue jelly base with large and medium white hex glitter, as well as what I think is white matte microglitter. I used two coats for my swatches. There was a LOT of the large hex glitter in this polish, so I didn't have to do any fishing for the pieces. It applied nicely, and only required a little bit of fussing with the large glitter placement to be perfect. I know of many jellies and jelly sandwiches that look "deep," but this one is by far the deepest in my opinion! 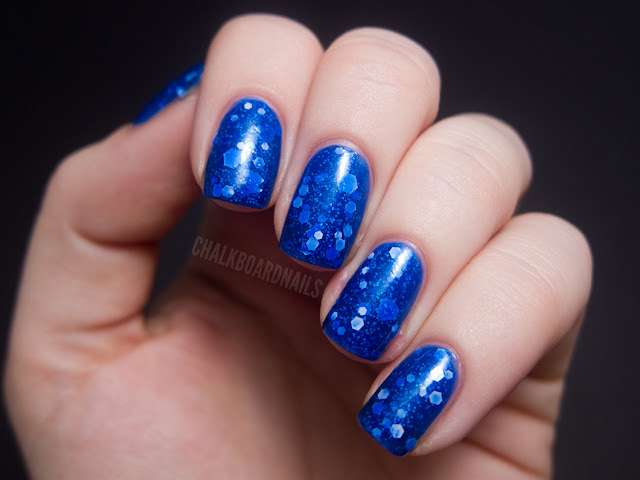 The blue is so vibrant and rich, and the layers of different sizes and types of glitter really give the polish some depth. I know I am quite lucky to own this, Nail-venturous Lacquers are quite popular and therefore difficult to get a hold of. Keep an eye on her Etsy shop and her Facebook page for restock information and availability. This is beautiful! If you don't mind can I link your blog on my Autism Awareness Inspired blue mani blog post? Beautiful, and such a good cause. Another set of gorgeous nails~ I love how deep this royal blue is! Wow, this polish is gorgeous! What a color and what a depth! This is a fabulous fabulous blue! I've been staring at the first picture for about five minutes now @_@. WOW, what a vibrant blue! Gorgeous! I'm such a blue polish person, be still my aching heart. Now THAT is a stunning blue! Congrats to Amy for creating it and to you for capturing it so well. What a crazy-amazing polish!! So much depth and such a gorgeous colour. The blue polish you chose is GORG. I'm wearing OPI's Ogre the Top Blue today. I'll be wearing blue polish all month to support Autism Awareness Month!!! Wow this is an amazing polish! Gorgeous! this is and amazing color! it looks stunning on you. appreciated your awareness! As a parent of a child on the Autism Spectrum, thank you for taking the time to learn about Autism and to spread awareness. It means the world to me and my daughter. It's wonderful to see fellow polish bloggers supporting this cause!! I'd recommend you google the phrase "Autism Speaks Doesn't Speak For Me." Autism Speaks rarely, if ever, has autistic people in leadership positions in the organization, and perpetuates a lot of feelings about autism that aren't held by people on the autism spectrum. Absolutely bluetiful! :o) I have many of her polishes and unfortunately this isn't one of them. YET. My god it look so yummy! 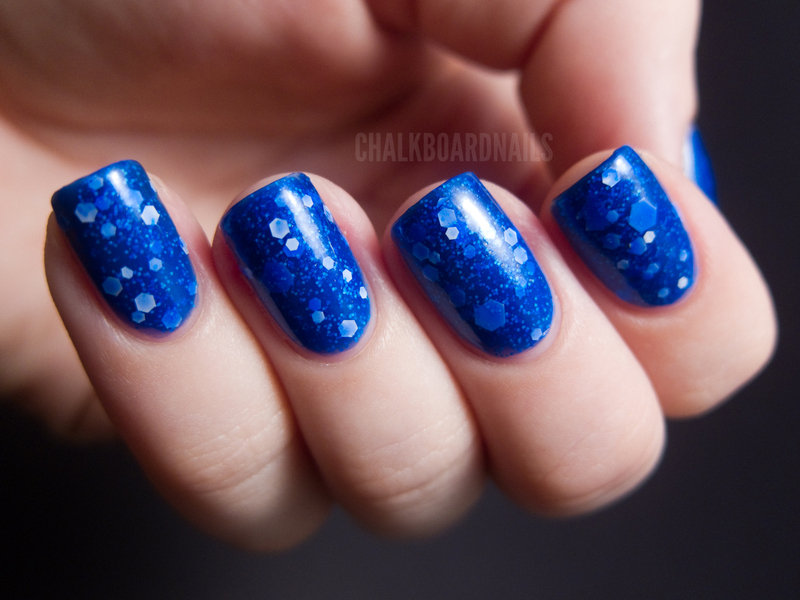 I love the brightness of the dark blue and the sparkles are so stunning! I love this blue. Thank you so much for participating in Autism Awareness month. This is my favorite color. That is one fabulous polish. I'm in love. get home. I'm amazed at how fast your blog loaded on my mobile .. I'm not even using WIFI, just 3G .